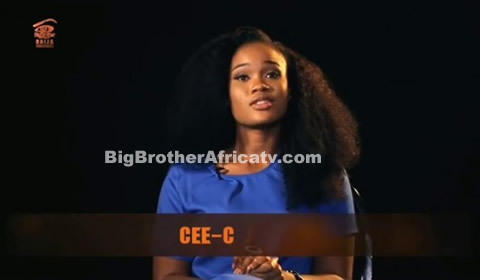 Meet Cee-C: She considers herself to be eye candy and also mentally attractive and does not like judgemental people. She will miss her pillow and duvet whilst in the House. She is 25 and aspires to going to film school and becoming a producer. Cee-C enters the House pretty satisfied to have found her purpose in life. Oozing confidence and authenticity, she said she is “eye candy” and “mentally attractive” too. Her features are enhanced by her love for dresses that hug her body at the right spots. The privately educated Cee-C likes to learn new stuff and is an avid novel reader. She is a mean cook and is an avid tennis player.